Results: 1 to 10 of a total of 257 results. Does nataraja77 belong in this group? I my favorite arts: EDM, graphic art, landscape... 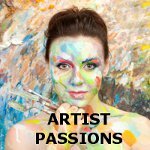 I'm looking to feed my interest in different art forms. I've been working on developing myself. I'm looking for interesting people to share interesting ideas with. Lover of art I have been interested in art ever since I was a child-love painting, drawing, photography, performance arts, dancing, ballet, modern dance. Any kind of artistic expression interest me. Enjoy museums, galleries, art openings and art walks, craft, jewelry designing. Does senneses belong in this group?